I had a few minutes to talk to Nancy about the history, timeline and importance of NFPA 350. Q: Why is NFPA 350 so important? A: There are still almost 100 workers killed each year in confined spaces in the United States. Confined spaces can be found in many facilities and workplaces so unless they are identified and confined space entry procedure developed, these spaces will continue to be “ticking time bombs” that under the right conditions can kill an unsuspecting worker. Q: What was the timeline of the creation of NFPA 350? A: First meeting of the committee held Sept 2012. Preliminary draft to Standards Council for approval August 2013. Out for public input until January 2014. First draft meeting held April 2014. Out for comment until November 2014. Second draft meeting held April 2015. Open for NITMAMS until August 21, 2015. No NITMAMS so will be released this November. Q: Who are the people that NFPA 350 will help? A: Ultimately the people who go into those spaces will benefit if their employer follows OSHA regulations and uses NFPA 350 to help them comply with those regulations. But will help those using OSHA regulations-supplements and supports, provides guidance and how-to’s and goes beyond minimums which will help improve worker safety. Q: What is the difference between OSHA requirements and NFPA 350? Or in other words, how does NFPA 350 bridge the gap between OSHA? A: NFPA bridges the gap between performance based minimum confined space entry standards by providing some of the “how to’s” and best practices for activities such as hazard identification and control, gas monitoring and ventilation. It also starts to define competencies for those involved in confined space entry and encourages the use of management of change and prevention through design to get to the core of many confined space entry challenges. Q: What has been your most challenging moment in working with the technical committee? What has been the most rewarding thing in dealing with the technical committee? A: Most challenging-discussion about how to “fix” and simplify some of the language in OSHA standards. For more than 20 years the term “permit-required confined space” has been used yet it continues to create confusion. The most rewarding was when we figured out how to simplify the language without conflicting with existing standards. 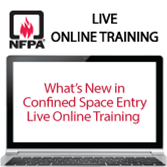 Nancy will be hosting a live, online training event on October 28, 2015 from 11 am to 1 pm EDT on the subject of “What’s New in Confined Space Entry.” Click here for more information or to register. A code is a code, not a design manual, says Wayne Moore, vice-president at the fire protection engineering firm of Jensen Hughes. In this case, the code is NFPA 72®, National Fire Alarm and Signaling Code, which contains the minimum requirements necessary to install a reliable fire alarm system. However, it does not include all of the information a fire alarm systems design engineer must know and use. Generally, the NFPA technical committees that develop NFPA’s codes and standards try to address most of the situations that those in the field will encounter, but they cannot address every issue that may arise. Rather, they expect that qualifieds individual will design the appropriate systems the codes cover and define the qualifications of both the system designer and the installer. For more on this subject, read Moore’s column “Think for Yourself” in the September/October issue of NFPA Journal. At NFPA, we realize that many teachers have difficulty finding the right fire-safety materials for different grade levels, says Amy LeBeau, senior project manager in NFPA’s Public Education Division. As a result, we launched a school outreach program that focuses on a blended-learning approach using interactive apps and lesson plans that feature targeted fire-safety messages. We encourage fire safety educators to incorporate digital learning tools into their fire prevention programs as part of this year’s activities for Fire Prevention Week, which runs from October 4 to 10. Finally, we’ve published the Rescue Dogs, Firefighting Heroes, and Science Facts eBook, which helps reinforce fire-safety messages for students in Grades 2 through 5 while building their reading comprehension skills, fluency, vocabulary, and more. For more information on these exciting apps, read Amy’s column “Making It Stick” in the September/October issue of NFPA Journal. Receive the print issue of NFPA Journal and browse the online, member-only archives as part of your NFPA membership. Learn more about the many benefits and join today. A recent decision by the New York Fire Prevention and Building Code Council to not include a sprinkler requirement for new homes hasn't stopped fire officials from speaking out about this life-safety feature. Despite the council's vote, the fire service and other safety advocates are planning on voicing the importance of such a requirement during New York's Department of State public-review process that precedes the new state building code becoming law. The department will finish the review process by early 2016, according to a story in the Watertown Daily News. Regarding the code council's vote, "I'm disappointed they chose to put profitability of builders over safety," said Jerry DeLuca, executive and CEO of the New York State Association of Fire Chiefs and member of the New York Sprinkler Initiative told the paper. The International Code Council (ICC), NFPA, and ICC’s Solar Rating & Certification Corporation (ICC-SRCC) collaborated to publish the 2015 International Solar Energy Provisions and Commentary. Working together, we hoped for a helpful resource, as this new publication is the first of its kind to include solar energy code-related provisions, commentary and selected standards in a single, comprehensive place. This document will help code officials fulfill their responsibilities efficiently and assure code compliance for photovoltaic panels, solar water heating products and solar collectors. It empowers communities to meet their goals for alternative energy and also goes a long way in ensuring that solar energy is properly installed, maintained and handled during emergency situations. The 2015 International Solar Energy Provisions and Commentary is available for purchase in hardcopy or PDF Download from ICC or NFPA. Anyone may submit a comment on this proposed TIA by the November 20, 2015 closing date. Along with your comment, please identify the number of the TIA and forward to the Secretary, Standards Council by the closing date. In the Library, we get many requests for information about historic fires. Recently we were asked to research the 1916 conflagration at Paris, Texas. Paris, Texas is located about 100 miles north east of Dallas. In 1916, it is estimated that the population was about 15,500. The city was a local trading center, and as such had a larger business district than other cities of similar size and population. The business district was closely built-up but the residential portions of the city were less so. However practically all the homes had shingle roofs. No rain had fallen in Paris for more than 7 weeks when the fire began. The fire started about 5:30 pm on March 21, 1916 in a frame warehouse in a southwestern portion of the city. Fire brands were lifted by the wind, which was estimated to be blowing at 35 miles per hour, and set fire to buildings several blocks away. It is noted that in the early minutes of the fire, that occupants of buildings attempted to extinguish small roof fires with garden hoses and buckets of water to no avail, but that a few, determined in their efforts, succeeded in significantly narrowing the path of the fire. By 7:00 pm however, the fire had advanced and aid from nearby Oklahoma and Texas towns and cities was requested. By 10:00 pm the fire had spread in the business district and brands were lighting fires in the area north of the district. By 3:30 am the following day, the fire was finally under control. The devastation was remarkable. More than 264 acres were burned. 1440 buildings were lost, resulting in the destruction of most of the business district, several churches, schools and public buildings, and more than 700 homes. "The firemen were not able to hold the blaze to the first building being burned, for the reason that the brands carried by the high gale had set on fire buildings four, five, six and even ten blocks away and, in practically every instance, the fire started on the roof of the building. These in turn, would send their burning brands on the wings of the wind to other buildings with shingle roofs until every dwelling on both the south and east sides of the business section was a seething, roaring, mass of flames; and notwithstanding the fact that the roofs of the business buildings had refused to take fire from the burning embers that had fallen upon them like a rain of hail for some time, when the half-circle of fire around the business district had closed in, the intense heat of the wind-driven flames and the flying brands and coals which were many inches deep in the streets, broke through the windows and doors, and when once an entrance was effected, the doom of the business section was sealed." Paris, Texas Conflagration, NFPA The writer believed that had the roofs of the business district been of non-combustible material, that the Paris fire department alone could have held the blaze to the block in which it originated. He also noted that the destruction in Paris was greater in its completeness and burned area than that of the Baltimore conflagration, at least in proportion to populations. The Charles S. Morgan Library supports the research activities and maintains the archive of NFPA. In addition to the NFPA report which contains a map indicating the area burned in the conflagration, we have a copy of the NBFU Committee on Fire Prevention Report on the conflagration, which was the source of the images in this post. Learn more about the Library and Archives, our resources, and services. Between fighting fires and responding to other emergencies, fire fighter personal protective equipment (PPE) is exposed to a wide range of toxic chemicals, biological pathogens and other hazardous substances. It’s well recognized that these contaminant exposures can pose significant risks to fire fighters’ immediate and long-term health, with cancer topping the list of concerns. However, knowing if current or new cleaning procedures adequately remove contaminants from PPE has yet to be fully determined. Meanwhile, incidents like the Ebola outbreak have reinforced that we also don’t know what it scientifically takes to remove air- and blood-borne pathogens that first responders come in contact with as well. The Fire Protection Research Foundation (Research Foundation) recently received nearly $900,000 in Assistance to Firefighter Grant (AFG) funding to find out. Over the next three years, the four-phase project will work to scientifically identify and establish procedures that measure how effectively cleaning processes remove a broad range of contaminants that fire fighter PPE is exposed to. The National Institute for Occupational Safety and Health (NIOSH), among other project partners, will be working collaboratively with the Research Foundation on this project. To learn more, visit www.nfpa.org/PPECleaning. Thank you FM Global for participating in the 2015 NFPA Backyards & Beyond sponsorship program! We appreciate your continued support. For 175 years, many of the world’s largest organizations have turned to FM Global to develop cost-effective property insurance and engineering solutions to protect their business operations from fire, natural disasters and other types of property risk. FM Global ranks #545 among FORTUNE magazine’s largest companies in America and is rated A+ (Superior) by A.M. Best and AA (Very Strong) by Fitch Ratings. The company has been named “Best Property Insurer in the World" by Euromoney magazine and “Best Global Property Insurer" by Global Finance magazine. You can view the full list of exhibitors and sponsors who will be participating in the 2015 NFPA Backyards & Beyond event at http://www.nfpa.org/training/backyards-and-beyond. Thank you and we look forward to seeing you in Myrtle Beach! The Looking Back feature in the new September/October NFPA Journal didn’t have to look back too far to highlight the Centralia, Pennsylvania, coal mine fire. It’s actually still burning today, after more than 50 years. The fire started at the Centralia town dump in May 1962, where burning trash lit an exposed coal seam at the mouth of a mine. For several years, the residents of Centralia didn’t seem to mind the fire burning beneath them. Many no longer had to shovel snow; some could even grow tomatoes year-round in the warm ground. But the honeymoon ended when residents began passing out from toxic gases, when the main road dropped eight feet and that time a fracture in the earth almost swallowed a boy. Learn about suppression efforts, relocation efforts and the just ended legal fight between the government and some town residents to remain in the town despite the risks, all in the new NFPA Journal. While NFPA 70E®, Electrical Safety in the Workplace®, is the standard for safe work practices, numerous installation requirements in NFPA 70®, National Electrical Code® (NEC®), provide the means to implement those practices. A number of proposed changes to the 2017 NEC that target the installer and maintainer community are part of an ongoing effort to promote safe work practices through installation rules. One of them calls for the provision of warning label at service equipment to provide the nominal system voltage and the arc-flash boundary, while the other expands the working space requirements for equipment rated 1,000 volts and less for electrical equipment installed in locations that are not at grade, floor, or platform level. For more information on these proposals, read Jeff Sargent’s column “Ties that Bind” in the new issue of NFPA Journal. The National Fire Protection Association (NFPA), the Fire Protection Research Foundation (Research Foundation) - the research affiliate of NFPA, and the National Institute for Occupational Safety and Health (NIOSH) signed a Memorandum of Understanding (MOU) today at NFPA headquarters in Quincy, MA. The signing represents the third agreement between the two organizations and an alliance that began some 10 years ago. The MOU, which was signed by Jim Pauley, NFPA president, Casey Grant, executive director for the Research Foundation, and Dr. John Howard, director of NIOSH, solidifies the pathway for NFPA, the Research Foundation and NIOSH to continue working collaboratively on multiple projects and initiatives, particularly those that address fire fighter health and safety. As an example of these ongoing collaborative activities, the Research Foundation is currently working in coordination with NIOSH on a comprehensive, four-phase research project to identify what procedures are needed to ensure optimum contaminant removal from fire fighter personal protective equipment (PPE). Traditionally, fire museums in the United States and Canada have been operated by firefighters and fire buffs without museum backgrounds, but this is fast changing, says Lisa Braxton, associate project manager in NFPA’s Public Education Division. Nowadays, fire museums offer multi-sensory learning experiences, emerging as valuable educational tools that weave fire safety education into the museum experience. In an effort to maintain their relevance to contemporary audiences, many fire museums now try to immerse museum visitors in the firefighter experience by including interactive displays and organizing their collections of artifacts accordingly. They are developing membership programs and pursuing grants. At a time when many fire departments are cutting back on their public education programs because of budget constraints, fire museums are also aligning their programming with state educational learning standards to keep their goals compatible with those of teachers. To see how fire museums across the country have transformed themselves from static presentations of historic artifacts to dynamic, hands-on, family-focused institutions, read Lisa’s article “Hands-On History” in the new issue of NFPA Journal. Finding the right age-appropriate fire-safety materials for different grade levels can be a challenge, so NFPA’s school outreach program has worked at developing a blended-learning approach through interactive apps and lesson plans, which encompass targeted fire-safety messaging. In her column “Making It Stick,” in the new September/October issue of NFPA Journal, Amy LeBeau, a senior project manager in NFPA’s Public Education Division, discusses a number of new tools NFPA has developed to help kids learn more about fire safety. That includes a couple new fun apps, a children’s ebook, and more. Learn all about these useful tools in the new NFPA Journal. Get excited for community preparedness! Your favorite safety friends like our very own Sparky the Fire Dog, along with Smokey Bear, Lassie and others, will be participating in a live Twitter chat focused on preventing and preparing for hurricanes, tornadoes, wildfires, earthquakes and more! The ‘Safety Friends Unite for Preparedness’ Twitter chat takes place on September 22 at 3PM ET, don't forget to check it out using the hashtag #SafetyChat! This Twitter chat is part of FEMA's National Preparedness Month. “Don’t Wait. Communicate. Make Your Emergency Plan Today.” is the message emergency managers are sharing with people through the month of September. Additionally, September 30 is National PrepareAthon! Day. You are encouraged to participate by doing a simple, specific action or activity to improve your preparedness and your family’s preparedness; or it can be something more elaborate that involves your neighborhood, your place of worship, your entire workplace or your community. Visit www.ready.gov or www.ready.gov/prepare for more information on America’s PrepareAthon! You can find tools to stage your own emergency preparedness drills, as well as register any preparedness activities for you or your community. Thank you Esri for participating in the 2015 NFPA Backyards & Beyond sponsorship program! We appreciate your continued support. Please visit Esri in booth 205 October 22-24 to learn more about their products and services. GIS software from Esri enables search & rescue personnel to capture and create an integrated picture of information in the form of interactive maps and reports on the desktop, handheld, or in the emergency vehicle. GIS will help you unlock the spatial component of your valuable data and see your information from a new perspective. Despite its 400-plus pages. NFPA 13, Installation of Sprinkler Systems, makes an admission that it does not, and never will, contain all of the answers to every question and every scenario encountered by its users. To that end, sections 1.5 and 1.7 of NFPA 13 address equivalencies to the standard as a means of addressing new technology, alternative means and methods, and matters otherwise not provided for. Matt Klaus, an NFPA principal fire protection engineer and staff liaison for NFPA 13, addresses these equivalencies and how they are meant to be used in his new In Compliance column “Other Means,” in the new September/October issue of NFPA Journal. Learn more about this issue by reading Klaus’s column at nfpa.org/journal. When the University of New Haven Fire Science Club (UNH) decided to host a national campaign and Campus Fire Safety Sweepstakes & Contest to raise awareness for fire safety on college campuses, they turned to The Center for Campus Fire Safety (the Center) and National Fire Protection Association (NFPA) for statistics and resources that would engage college communities. UNH students developed a Facebook contest and made quick videos with key messages to call attention to September being Campus Fire Safety Month. The Center and NFPA provided fire safety questions to ask landlords and school officials, and videos, checklists, tip sheets, infographics and flyers for social media, college websites, dorms and common areas. A great partnership was born, a new collaborative effort is currently underway, and students are learning that proactive behavior will help address the 24 percent increase in dorm fires that occurred across the country from 2003-2013. Domino’s and the American Burn Association Burn Prevention Committee also recognized that most college students, many living on their own for the first time, often don’t consider the fire safety implications of their housing choices. So, they, too, signed on to help stimulate interest and raise awareness for campus fire safety. Domino’s offered a popular college staple – pizza – to motivate students to enter the UNH Facebook contest and to learn more about preventing fire on campus. They will provide pizza parties for 50 to two sweepstakes winners and award an IPad mini 3 to the student whose paragraph submission best explains how they will keep themselves and their neighbors safe from campus fire. The ABA’s involvement underscores the importance of cultivating multi-agency partnerships with organizations that share consistent messages about fire safety. ABA’s partnership with UNH, NFPA, The Center and Domino’s ensures that the campus fire safety discussion extends beyond college settings to medical circles, burn communities and business influencers. By joining forces to raise awareness for campus fire safety, The University of New Haven Fire Club, The Center for Campus Fire Safety, NFPA, Domino’s and the American Burn Association are showing the power of partnerships and the tremendous impact that organizations have when they collaborate on education, outreach and advocacy. Several times every year, Lucien Deaton, manager of the Firewise Communities and Fire Adapted Communities Programs for NFPA, travels around the United States to meet those who use the programs to teach the public about the risk of wildfires. In the current fiscal environment, he says, these partners are being asked to do more with less funding and smaller staffs, even as people continue to move into the wildland/urban interface. With state budgets for prevention and preparedness shrinking and the demand for investment in land management growing, we must help our partners ensure that they can apply the right resources to the landscape before it’s too late. Fortunately, advocating for prevention and preparedness through economic ups and downs is not foreign to NFPA or to local fire departments, state agencies, code officials, fire marshals, and residents. Information about TakeAction: Empowering youth through new wildfire awareness campaign, which speaks to middle and high school students who want to help their neighborhoods better prepare for wildfire. Year of Living Less Dangerously from Wildfire campaign: Residents embrace widlfire safety actions. How-To Tips on incorporating Firewise principles. Virtual workshop to focus on Firewise community days to be held on September 29 at 1:00 PM EST. !http://nfpa.typepad.com/.a/6a00d8351b9f3453ef01b7c6d4f394970b-450wi|src=http://nfpa.typepad.com/.a/6a00d8351b9f3453ef01b7c6d4f394970b-450wi|alt=Sept171984|style=width: 350px;|title=Sept171984|height=373! On Monday, September 17, 1984, at approximately 4:00 p.m., an explosion occurred in a cold storage warehouse building near Shreveport, Louisiana. The explosion occurred while two members of the Shreveport Fire Department&#39;s Hazardous Material Unit were attempting to isolate an anhydrous ammonia leak in a section of the building&#39;s refrigeration system.&#0160; Employees had earlier detected the leak and workers had begun repairs earlier in the day, but were unable to complete the repair due to the effects of the ammonia. Last year firefighters responded to an estimated 1,298,000 fires in the United States. Twenty-four of these fires were categorized as catastrophic multiple-death fires, defined as fires or explosions in residences that result in five or more fire-related deaths, or fires or explosions in all other structures and outside of structures, such as wildfires and vehicle fires, that claim three or more lives. The new September/October issue of NFPA Journal includes a detailed look at the 2014 U.S. Catastrophic Fire Report compiled by NFPA’s Fire Analysis and Research Division. The article includes a synopsis of the statistics, as well as the conditions and circumstances behind these tragedies. These 24 fires killed 128 people, and accounted for 0.002 percent of the total estimated fires and 3.9 percent of the total fire deaths in the U.S. in 2014. By comparison, there were 20 catastrophic multiple-death fires in 2013, resulting in the deaths of 122 people, including 28 children under age six. To learn much more about these events read the new NFPA Journal, and to read the full report, visit nfpa.org/catastrophic. To All U.S. Fire Departments: The 2015 U.S. Needs Assessment survey is now online. Fill it out to make sure your needs are heard! The U.S. Needs Assessment survey asks fire departments where you’re meeting the needs of your communities and where there are gaps in the service you provide. The U.S. Congress and the U.S. Fire Administration (USFA) rely on that feedback to help determine where the nation’s fire service funding should be allocated. This presents a unique, powerful opportunity to show where you need help, and to get the support you need. The survey can also be used to compare your fire department’s resources to those of others with comparable demographics and populations. This can be extremely helpful when showing local legislators and officials where you’re meeting your community’s needs, and where you may be lagging behind. But the survey is only as good as the data provided by fire departments. Simply put, the higher the participation rate, the better and more accurate a picture the survey will paint about the true challenges the nation’s fire service is facing today – and will likely face in the years ahead. So make sure to fill out the 2015 Needs Assessment survey as soon as you can! It’s available online for the first time, making it easier than ever to fill out and return. The fire chief of each fire department (or an assigned designee) is asked to fill it out. We’ve also mailed out a print version (as we’ve done for the previous three surveys). Learn more about NFPA's U.S. Needs Assessment survey initiative, which began in 2001, and see why it’s worth ALL fire departments’ time and effort to complete. Local fire departments are critical to the success of Fire Prevention Week - we count on their participation and support each year to reach local communities with the campaign's fire safety messages. In appreciation of those efforts, we’re kicking off the Fire Prevention Week 2015 Challenge, which works to recognize the hard work and creativity of fire departments that are actively promoting Fire Prevention Week in their communities this fall. Here’s how the Fire Prevention Week 2015 Challenge works: All U.S. fire departments are invited to send NFPA a picture of an event they’ve hosted in support of Fire Prevention Week and this year’s theme, “Hear the Beep Where You Sleep: Every Bedroom Needs a Working Smoke Alarm.” Pictures can be submitted for an event a fire department has held anytime between now and October 31, 2015. The application is available online at www.nfpa.org/firepreventionweek. Participating in the Challenge activity also fulfills the requirements of the Federal Emergency Management Association’s (FEMA) Preparathon!® campaign, which works to increase the number of Americans who understand the disasters most relevant their community, while educating them on ways to be safer and mitigate damage. All winners will be notified and announced in November, and their events will be promoted on Safety Source, NFPA’s public education newsletter; NFPA’s social media platforms and website; and featured in a blog highlighting their efforts. Fire chiefs from the U.S., U.K. and Canada met last week for NFPA’s Urban Fire Forum (UFF). Three important documents were endorsed by the group of attendees as official UFF-Metro Chiefs position papers, with the goal of using the latest research and best practices in fire response and preparation. Warehouse Fires and Pre-Fire Planning – Emphasizes the importance of pre-fire planning for warehouses. FM Global research shows that in-rack sprinklers are the only way to prevent rapid spread of fire in rack storage. The sprinklers not only minimize the threat of spreading by pre-wetting areas in the path of fire, but also guard against possible roof collapse by cooling the ceiling. Effective planning requires the cooperation of multiple parties, and entails attention to several categories including building construction features, types of sprinklers, and size and location of underground mains. -Fire Community Assessment Response Evaluation System (FireCARES) – Designed to assess community risk, structural hazards, and fire department response capabilities. This easy-to-use system encourages accurate and timely risk/resource assessment for planning and budgeting safety of the public and firefighters, and will assist decision-makers in evaluating how a fire department’s resources measure up to its needs. -National Fire Operations Reporting System (N-FORS) – A user-friendly online tool for fire service data collection and analytics. This software will allow for the sharing of fast and accurate information which will assist fire service leaders in making the best decisions for response operations. N-FORS will be key in determining the best practices as well as the most effective and efficient allocations of resources. “These position papers are critical resources for departments to use to apply the latest fire research and implement the best practices for usual and extraordinary circumstances,” said Russ Sanders, NFPA Metro Chiefs Executive Secretary and UFF coordinator. For further information on these topics, please read the full documents. It is comforting to know that new, code-compliant buildings offer occupants, regardless of their mobility issues, safe egress systems, says Ron Coté, principal life safety engineer at NFPA. In buildings that are fully protected by an approved, supervised sprinkler system, provisions of NFPA 101®, Life Safety Code®, permit a floor to serve as an area of refuge, even if it does not have special fire-rated or smoke-resistant barriers. The area may become smoky and potentially frightening to someone who remains behind when most others have evacuated, but the area should not be endangering. NFPA 101 also requires the area of refuge in a sprinklered building to have a two-way communication system between each elevator landing and the fire command center or a central control point approved by the authority having jurisdiction, an additional feature not required by the other accessibility documents. For more information on accessibility provisions in NFPA 101, read Ron’s column “And Egress for All” in the new issue of NFPA Journal. Dust explosions have always been considered an industrial danger, certainly not something to worry about at a concert or celebration. That perception was forever changed in June, when a cloud of colored cornstarch dust exploded at a packed concert in New Taipei, Taiwan. The explosion sent a giant fireball through the crowd, burning hundreds of people and killing at least 11. The unprecedented explosion, it’s aftermath and NFPA’s response is the subject of an article “Powder Keg” in the new September/October issue of NFPA Journal. It is also the subject of a new NFPA Journal podcast, “Dust Explosions and Color Runs," released last week on iTunes. On the new podcast, Guy Colonna, NFPA’s division manager of Industrial and Chemical Engineering, speaks to host Jesse Roman about how the dust explosion in Taiwan may have occurred, and what NFPA codes and standards could be used to prevent a similar tragedy from happening again. Colonna also offers advice to public safety officials in communities that might be hosting or thinking of hosting similar events involving powder, including “color runs”—fun-runs where participants have colored powder thrown on them—as well as Holi festivals, where revelers throw colored powder into the air. Learn more about the tragedy and the science of dust explosions in the new NFPA Journal and the NFPA Journal Podcast, which can be downloaded at iTunes, or played from your computer. Shaken by gun violence, more schools around the country are purchasing after market classroom door barricades that attach to the inside of the door, making it next to impossible to enter from the outside during an active shooter event. That’s good news if the sole aim is to keep a bad guy out. But what if the bad guy is already inside a classroom and it’s police or firefighters who can’t get in? What if kids are inside a classroom in lockdown while a fire is set and they need to get out? This emerging issue is explored in the ‘In a Flash’ section of the new September/October issue of NFPA Journal. The article, “What Price Security,” details NFPA’s efforts to strike a better balance between school security and fire and life safety in existing codes and standards such as NFPA 101®, Life Safety Code®. To pave the path forward, NFPA held a two-day “School Safety, Codes and Security Workshop” in Maryland last December, bringing together about 70 stakeholders, including firefighters, police officers, architects, security experts, school officials, code enforcers, building managers, and more. A link to the full report from the workshop can be found in the new article. “What Price Security” also details the controversy with these classroom door barriers in Ohio, where the state legislature passed legislation making it illegal to ban the devices in the state fire code. The law overruled the Ohio Board of Building Standards, which released a detailed report against allowing the door barricades. Susan Strasberg, the youngest actress to star on Broadway and enjoy marquee exposure when she played the lead role in Diary of Ann Frank in 1955 at age 18, once said about her grandparents, “I loved their home. Everything smelled older, worn but safe; the food aroma baked itself into the furniture. There is something about our grandparents’ homes that is comforting – not just for us but for our elderly loved ones, especially as they age. As we celebrate Grandparents Day on Sunday, September 13, think about your grandparents, the reassuring spaces they call home – and the many community champions out there that help our seniors to live safely in familiar territory as they age. For instance in Calgary, Alberta – the City of Calgary Fire Department, Calgary Seniors and Calgary Meals on Wheels have teamed up to keep elderly residents safe in their homes, delivering fire safety and fall prevention messages via local presentations and home visits. Devoted elderly advocates with the Calgary Fire Community Safety Division, Calgary Wheels on Meals and Calgary Seniors recently applied for – and were approved - to attend the 2015 Remembering When Scholarship Conference in Orlando, Florida in November. Remembering When is a Fire and Fall Prevention Program for Older Adults developed by NFPA and the Centers for Disease Control and Prevention (CDC). Representatives from Calgary will join teams from across North America to learn how to implement the Remembering When fire and fall prevention program. After the conference they will return to Calgary even more prepared to help older adults live safely at home for as long as possible. Thanks for looking out for the grandparents of Calgary. And to all the grandparents out there – enjoy your special day! For more on this story and how a disaster volunteer is looking to limit these tragedies by pitching for home fire sprinklers, visit the Fire Sprinkler Initiative blog. NFPA Standards in the Fall 2017 revision cycle are accepting Public Input through NFPA's online submission system. To submit Public Input using the online system, select the Standard from the list of NFPA codes and standards or search for any document available for public input using the search feature in the gray box. Once on the specific document information page, select "The next edition of this standard is now open for Public Input (formerly proposals)" to begin the process. The system shows any changes made by the submitter in legislative text. You have the option of submitting the input right away or saving it for later completion before the closing date. We are here to assist! If you have any questions when using the online submission system, feel free to contact us by email or call 617-984-7242. The deadline for online submissions of public input for the Fall 2017 documents is January 7, 2016. TIA issued on August 18, 2015. Take our poll. School classroom barricades: Life safety hazard, or necessary precaution? Shaken by gun violence, more schools around the country are purchasing after market classroom door barricades that attach to the inside of the door, making it next to impossible to enter from the outside during an active shooter or other type of emergency event. That’s good news if the sole aim is to keep a bad guy out. But what if the bad guy is already inside a classroom and it’s police or firefighters who can’t get in? What if kids are inside a classroom in lockdown while a fire is set and they need to get out? What do you think about the trend of more schools purchasing these barricades? How would you describe your view of school classroom door barricades? Tell us your thoughts, take a new NFPA Journal online poll. Also, to learn more about this timely subject, read the article “What Price Security,” in the new September/October issue of NFPA Journal. Take the poll today and let your voice be heard. To share additional thoughts on this subject, email journalpoll@nfpa.org. NFPA 1710, Organization and Deployment of Fire Suppression Operations, Emergency Medicals Operations, and Special Operations to the Public by Career Fire Departments, requires specific times for the response of fire and emergency services. But, according to NFPA's Division Manager for Public Fire Ken Willette, some fire departments have recently been criticized by local media and public officials for how they interpret these requirements. In Willette’s recent column in the new September/October issue of NFPA Journal, “How Fast is Fast Enough,” he sheds some light on the requirement, why it matters and how it should be followed. “Draft a fire department organizational statement, be transparent if you modify your travel-time objectives, address any gaps posed by the increased times, and share all of it with the public early and often—not just at budget time,” he writes. Read more in the new NFPA Journal, or at nfpa.org/journal. According to NFPA’s new vision statement, the Association is “the leading global advocate for the elimination of death, injury, property and economic loss due to fire, electrical, and related hazards.” While the mention of economic loss is new, there’s nothing groundbreaking about the concept for NFPA, says Kathleen Almand, vice-president of Research at NFPA. Almand notes that it became apparent that the cost of fire and fire protection occupies a more prominent place in conversations about fire safety during the research the Fire Protection Research Foundation did to prepare the Association’s new strategy. It also became clear that the cost of fire involves more than just the cost of fire department operations, sprinkler installation, and the like. It also involves the cost of fire injuries and the environmental costs of fire. To that end, the Foundation investigated the impact of home fire sprinklers in reducing the cost of fire injuries, and completed a report, "The Environmental Impact of Fire," which it recently published online. For more on the subject, read Almand’s column “Data Connection” in the new issue of NFPA Journal. Get the print edition of NFPA Journal and browse our online member-only archives as part of your NFPA membership. Learn more about the many benefits and join today. The September 2015 issue of NFPA News, our codes and standards newsletter, is now available. Anyone may submit a comment on these proposed TIAs by the October 16, 2015 closing date. Along with your comment, please identify the number of the TIA and forward to the Secretary, Standards Council by the closing date. At present there is a lack of characterization of common nuisance sources for the development of new performance test protocols. Accordingly, the Foundation initiated a project to work toward characterizing common nuisance sources for the development of new test protocols to meet the NFPA 72 requirements. This Phase 2 project involved collecting data to characterize nuisance sources from cooking and steam/water mist and comparing the nuisance source data to existing fire test data. !http://nfpa.typepad.com/.a/6a00d8351b9f3453ef01bb086d4779970d-800wi|border=0|src=http://nfpa.typepad.com/.a/6a00d8351b9f3453ef01bb086d4779970d-800wi|alt=New home|title=New home|class=asset asset-image at-xid-6a00d8351b9f3453ef01bb086d4779970d image-full img-responsive! If there&#39;s one myth fire sprinkler advocates hear ad nauseum, it&#39;s the one about fire sprinkler ordinances driving up housing costs and forcing homeowners to seek cheaper alternatives in neighboring communities or states. A recent article in +The New York Times+ notes this notion couldn&#39;t be further from the truth. [California has been requiring sprinklers in new homes since 2011, | http://www.firesprinklerinitiative.org/California] and has not seen a negative impact on housing stock or affordability. In fact, as the story states, "there's a robust demand for housing." For a state that's expected to swell to 50 million people by 2050, protecting its growing population with this level of home protection aims to have a positive impact on reducing home fire deaths in decades to come. Get all the facts by visiting NFPA's Fire Sprinkler Initiative blog. An up-close look at the problem of school science lab demonstrations gone wrong headlines the September/October issue of NFPA Journal, available online now. The issue also includes summaries of the 2014 Catastrophic Multiple-Death Fires report and the 2014 Fire Loss report, as well as a variety of pieces on the theme of educational and cultural occupancies. Our focus theme for the issue is educational and cultural occupancies, and our coverage includes “Hands-On History,” a feature on how fire museums—some 350 in the U.S. and Canada—are moving toward increased interactivity to draw broader audiences and offer fresh, dynamic takes on fire and fire history. In “Perspectives,” we have an interview with a member of Congress on a proposal that would require colleges to report sprinkler protection in all college-run student housing. Our “In A Flash” department leads off with a timely dispatch on schools’ efforts to improve security in the wake of shootings and other violent incidents—measures that may be compromising fire safety. In "First Word," NFPA President Jim Pauley writes of his recent trip to Costa Rica, and how that country can serve as a model internationally for how to build a system of fire protection for its citizens. NFPA public education Meredith Hawes spoke about electrical safety as part of her monthly guest spot on WTCM NewsTalk 580’s Safety Dance program. Hawes sat down with Christal Frost, host of the Traverse City, Mich. radio program, on July 24. According to Hawes, electrical fires account for 70,000 American fires each year, resulting in 485 deaths and $868 million in property loss on average. Aging homes with aging wiring are particularly at risk. As insulation in electrical outlets erodes around wiring, a definite fire hazard is created. Additionally, arcing with connections that are not tight accounts for about half of the above statistics. In these instances, electrical current jumps gaps in a circuit, and causes power to come and go. If you see lights flickering or going on and off, this is an indicator of arcing, and a sign that you should call an electrician. “What we’re really trying to drive home this morning is if you’ve got any of these issues, get an electrician in to take care of them,” said Hawes. It is also important to keep these ideas in mind for newer homes, as they will be affected as time goes on. If concerns are raised, an inspection should be done by a professional. “All homes will eventually be aging, so this is something you just need to be aware of,” she said. Also in the interview, Hawes covered several tips for guarding against electrical fires, including information on wattage of appliances, different types of outlets, where objects should and shouldn’t be plugged in and buying reliable products. She also stressed the importance of putting safety above cost concerns. Listen to the full interview for more information on electrical safety in the home. With the start of the school year upon us, help us spread the word and raise fire safety awareness on college campuses starting with the students you love! Share our contest video and rules and visit NFPA's and The Center's webpage for everything you need to get the discussion going.